Dateline Dec 10th 2010: KEYFAX NewMedia, producers of the Art & Science Of Sound Recording will be exhibiting at the Winter NAMM Show in Anaheim, California Jan 13-16 2011. 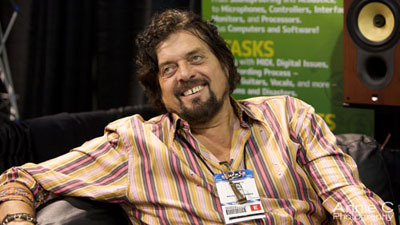 Alan Parsons will be in attendance during the show and a timetable of his daily appearances for autographs and general chit-chat will be posted at the Keyfax booth. Alan will also be taking part in at least one event at the H.O.T. Zone area, a special series of mini seminars and ‘solutions’ on the mezzanine level at the Convention Center. Trade or education visitors who would like to schedule a meeting can contact info@keyfax.com. Individual visitors, whether customers or nor, are more than welcome to stop by and say hi. Playback of scenes from the series will be running throughout the show. Rumors of ASSR t-shirts are yet to be confirmed. KEYFAX NewMedia is at Booth # 6531 in the main Hall.